By measuring weight we can decide the object is heavy or not. If there is a huge difference between the objects then just by observation we can say which one is heavy. The objects we can easily lift are called lightweight objects. For example : Feather,paper, cotton, petal of flower etc. To know exactly which object is heavy and which one is light then we use a balance. There are different types of balance machines. 1) manual 2) electronic. In manual balance there are two identical pans hung on either side. There is a pointer in the middle rod. Using to the position of the pointer we can easily say that which object is heavier. In the above balance there are two pans A and B.
towards B that means there is some heavier object in pan B than pan A. In the second figure, the pointer is in the middle and both the pans are at same level. So both objects have same weight. In the third figure, the pointer is towards A and pan B is up and pan A is down so there is some heavy object in pan A. There is a disc and in the middle of the disc there is a an electronic weight clock. Using that we can easily say which object is heavier. 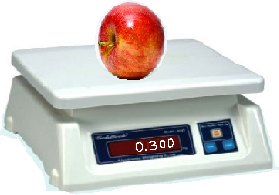 In electronic, balance we have to put the object on it and measure it. If we want to measure our weight then we have to stand on it and measure our weight. Practice Q.1 Which of the following objects are heavy? 2) Lunch box or empty lunch box. 4) Iron rod or plastic scale. 6) Apple or 3 bananas. Q.2 Below are given the weight of the object from that check which is light?